One of the most important debates in contemporary Islam concerns the possibility, and desirability, of accommodating classical Islamic law to modernity. 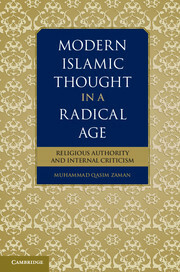 A new book by Princeton scholar Muhammad Qasim Zaman, Modern Islamic Thought in a Radical Age: Religious Authority and Internal Criticism (Cambridge 2012), addresses the debate. The publisher’s description follows. Among traditionally educated scholars in the Islamic world there is much disagreement on the crises that afflict modern Muslim societies and how best to deal with them, and the debates have grown more urgent since 9/11. Through an analysis of the work of Muhammad Rashid Rida and Yusuf al-Qaradawi in the Arab Middle East and a number of scholars belonging to the Deobandi orientation in colonial and contemporary South Asia, this book examines some of the most important issues facing the Muslim world since the late nineteenth century. These include the challenges to the binding claims of a long-established scholarly consensus, evolving conceptions of the common good, and discourses on religious education, the legal rights of women, social and economic justice, and violence and terrorism. The debates, marked by extensive engagement with Islam’s foundational texts and legal tradition, afford vital insights into the ongoing contestations on religious authority and on evolving conceptions of Islam in the Muslim public sphere. This wide-ranging study by a leading scholar of Islamic intellectual history provides the depth and the comparative perspective necessary for an understanding of the ferment that characterizes contemporary Islam.